– Roy Halladay was not sharp for the second game in a row. Not horrible by any means, but he did allow 4 runs (1 was unearned) over 8 innings. But the 11 hits he gave up was most surprising. 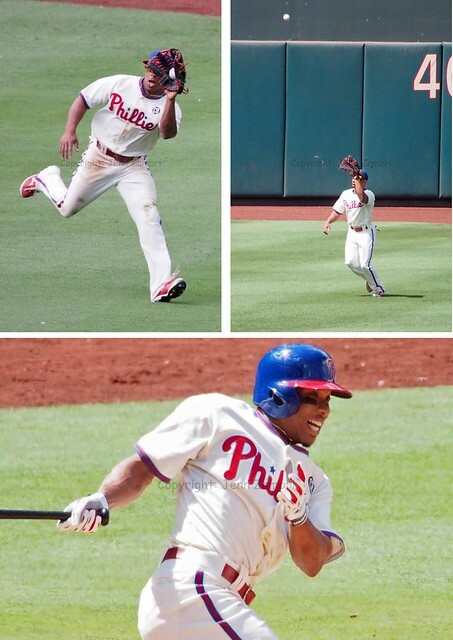 – Another shocker, the only run of the game for the Phils came on a homer run by Wilson Valdez. That is two days in a row for Valdez, now up to his 3 career homers in 4 years. – Shane Victorino got sloppy and threw a ball away which led to a run. – The offense, after 4 straight games of scoring at least 6 runs, went back to sleep. The painful parts? Everything else. After a horrible loss last night with the bullpen blowing a 5-run lead, this loss hurt that much more. 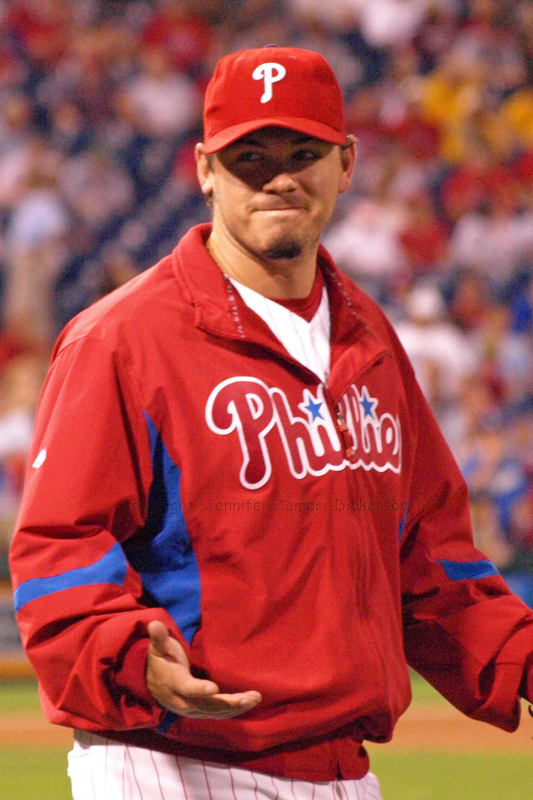 The Phillies are now 5.5 games back of 1st place in the NL East and show no signs of busting out. Is this Big Foot? Seriously, what the hell is this? Oh, ok….they say it is a groundhog, like in Caddyshack. 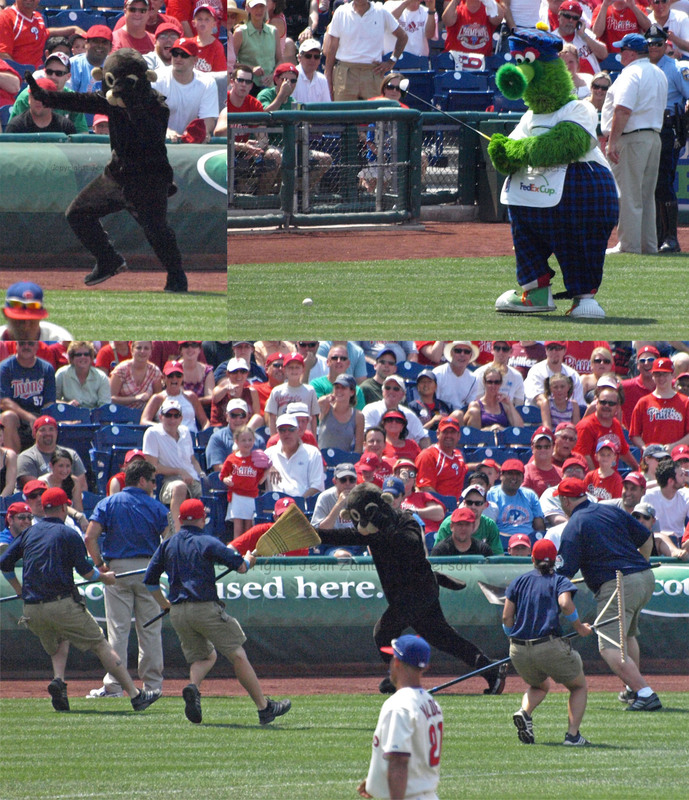 See, the Phanatic is golfing…on the ball field. Ok then. Distraction noted…thanks. Maybe they should hand a bat to Mr. Big Foot/Groundhog? He cannot do much worse than the Phillies and the opposition will surely be confused by the move. It’s official. I am a genius. Send in the Big Foot! If anyone else has a better idea, I mean besides kidnapping Joe Mauer and putting him in red pinstripes, please call the Phils and let them know. Thanks. So here is the Photo Album from today’s disastrous 1-4 loss. Think of it as another fun distraction and then go pour yourself a stiff drink. I know I will. The Phillies scored only 22 runs in the latter half of May, from the 18th to the 31st. But in the last 4 games, the Phillies have exploded to the tune of 31 runs. Today against the Twins, they scored 9 runs, had a 5-run lead in the 8th inning, and still lost the game. Cole Hamels got off to a bad start in the first inning, giving up 3 runs. A passed ball by catcher Brian Schneider and a bad throw to second by Hamels added fuel to the fire. But the offense immediately picked Hamels back up by getting those 3 runs right back in the bottom of the inning. 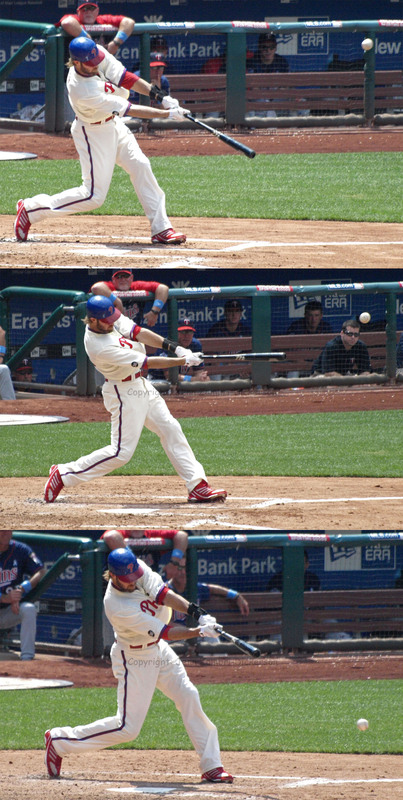 Chase Utley led the way with a 2-run triple and Jayson Werth hit a sac fly to score Utley. Every starter in the game, including Hamels, had at least one hit today. On the mound, Hamels later allowed a solo home run to Justin Morneau and ended the day with 4 runs allowed over 7 innings. If you forget about the first inning mishap, Hamels had a great day. But, as has been a common story line this year, the Phillies bullpen blew a FIVE run lead. In the 9th inning, former-Phil, Jim Thome hit a 2-run homer off Jose Contreras. 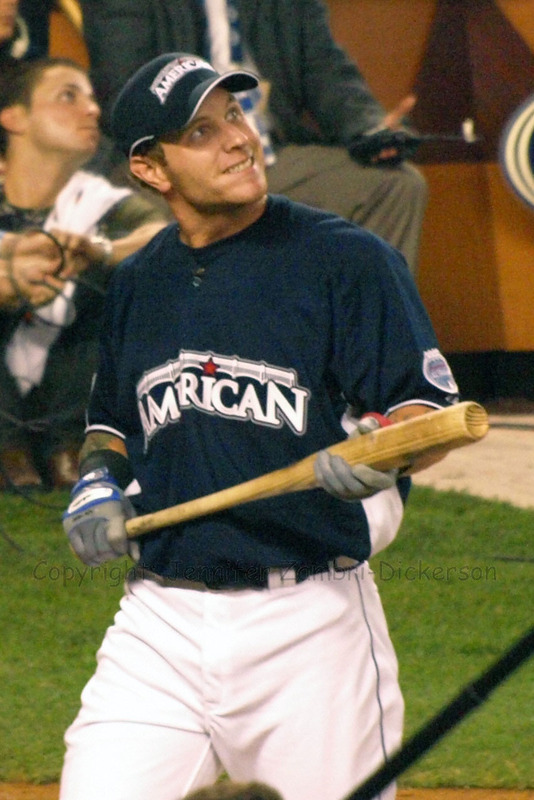 As it was then a save situation, Brad Lidge was brought into the game. And Lidge proceeded to blow the save and the remaining 3-run lead. He gave up an RBI-single and a 2-run homer to Twins catcher, Joe Mauer. 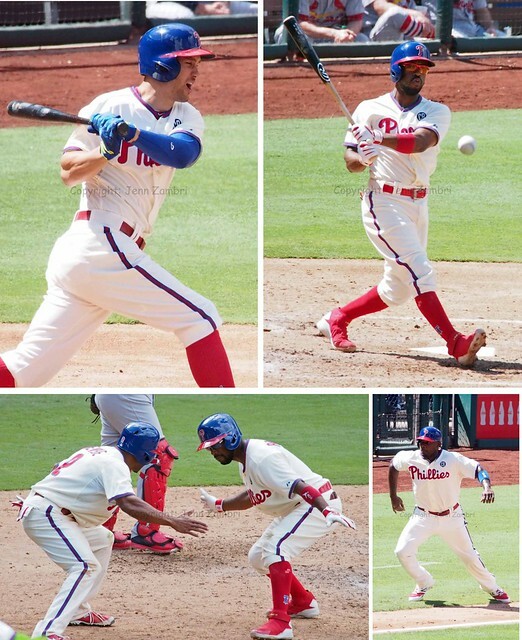 With a 9-9 tied game in the bottom of the 9th, the Phils got 2 hits but still failed to score and win the game. Howard and Werth both struck out. 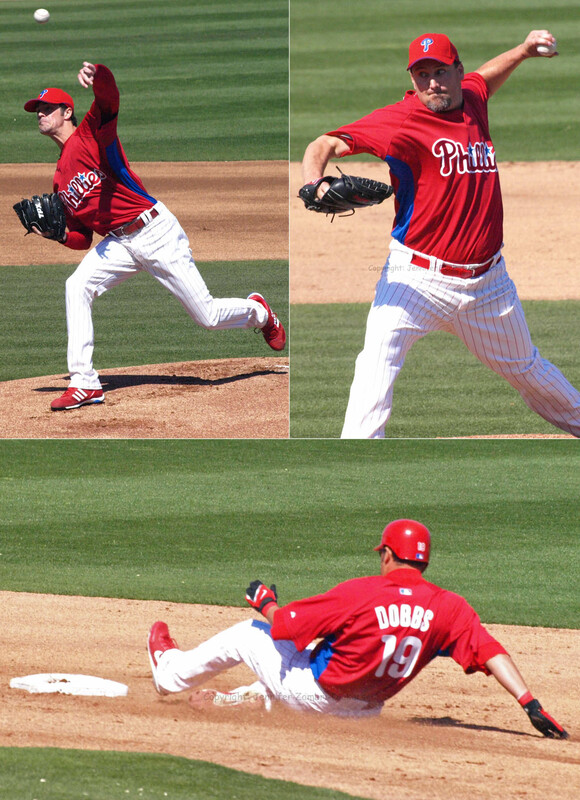 Chad Durbin came in for the 10th inning and as soon as I saw him on the mound, I thought, “Oh crap, he is going to give up a homer to the first batter.” Why do I think this? Because he has done it many times in the exact same situation. How many times, I do not know except to say that I have nightmares about it. Sure enough, 1st batter: homer. Valdez did not get a chance. Greg Dobbs popped out, Schneider grounded out and Ross Gload pinch hit for Valdez. Now, Gload did a homer with 2 outs to tie the game again. But again, no need to get excited because Danys Baez was going to pitch the 11th inning. Baez has been awful and today did not change that. He gave up THREE runs in the 11th just to make sure the Phillies had NO chance at a win. The Phillies went down in the 11th. It was a pathetic end to a pathetic loss. The final score was 10-13 and the Phils now have one game left against the Twins. If Roy Halladay can get back on his game after allowing 6 runs in his last outing, the Phils could maybe salvage a series win. Game time is 1:35pm and I will return with photos. In other news, Carlos Ruiz will get a few days off after being nailed in the head with a broken bat while behind the plate yesterday. He will not need a trip to the DL, which is great news. Scott Mathieson was designated for assignment to make room for catcher Dane Sardinha who will back-up Schneider until Ruiz is healthy. The St. Louis crowd loves Ryan Howard. But when Albert Pujols made his entrance, the fans officially went nuts. Both sluggers were favorites to win the 2009 Home Run Derby; Pujols playing for the Cardinals and Howard, a St. Louis native, both had a lot of support going into the contest. The first round results, which put Pujols into a swing-off with Joe Mauer and Carlos Pena, ended with both Pujols and Howard making the second round along with Prince Fielder and Nelson Cruz. Pujols ended round #2 with 11 total homers and Howard wound up hitting 15. Cruz stepped in for his turn and out-did Howard by just one home run for 16 total. Howard’s last hope was that Fielder, the final batter in round 2, would not surpass his 15 homers. 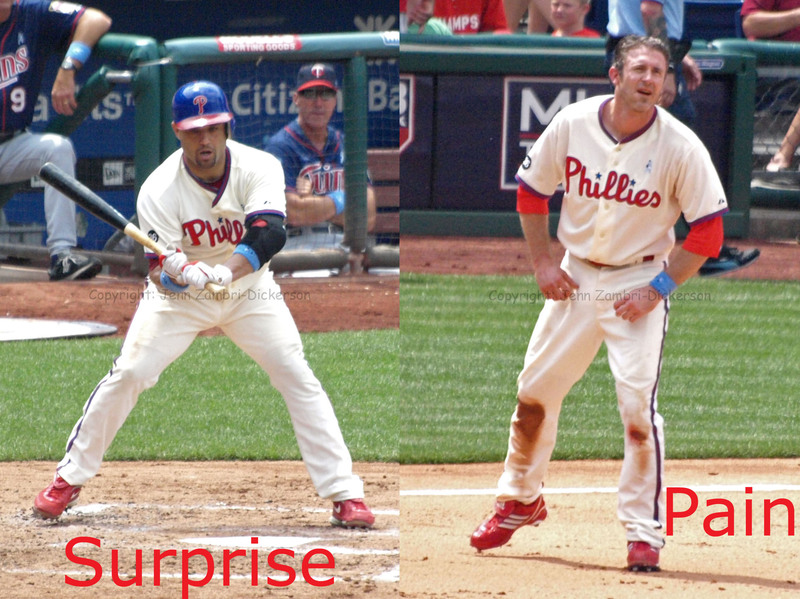 Sadly for Phillies fans, Fielder wound up hitting 17, knocking Howard out of the contest. Ryan seemed relieved though, as exhaustion set in and he was likely happy to be done. It was a nice effort all around, although not as exciting as last year’s derby where Josh Hamilton put on a show that will probably never been repeated. Hamilton hit 28 homers in the first round, many of which disappeared from sight in old Yankee Stadium. Although he went on to take 2nd place to Justin Morneau, those of us who witnessed the amazing display of power and grace will not soon forget it. I had a feeling this year’s derby would pale in comparison, but how could it not? But the derby is always an entertaining event that I look forward to seeing every year. And the 2009 champion is Prince Fielder, who hit 6 in the final round to Cruz’s 5. Congrats to Fielder! Tune in for the All-Star Game tomorrow night at 8pm on FOX. Tim Lincecum will start for the NL and Roy Halladay for the AL. 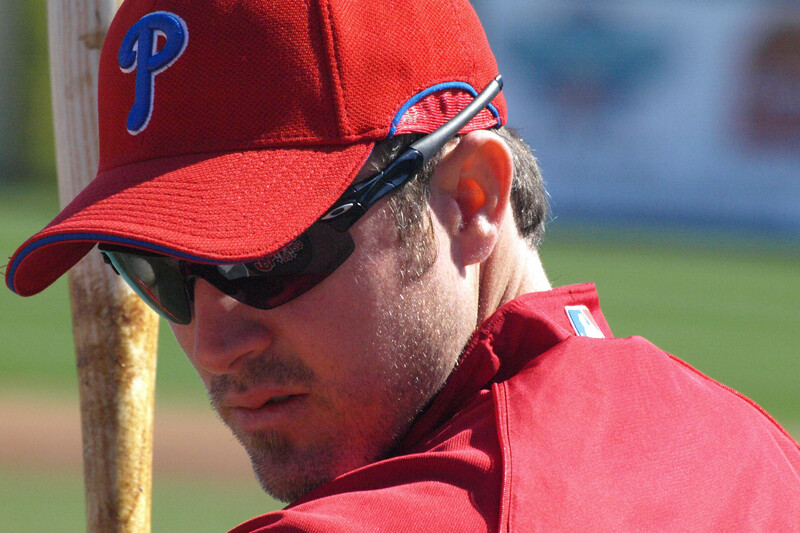 As for your Phillies, Chase Utley gets the start at 2nd, Raul Ibanez in left and Shane Victorino in center. Howard and Jayson Werth will be available on the bench. – The NL will finally break the curse of 11 straight AL wins (plus 1 tie) and win the game! – Chase Utley will look FABULOUS, even if he strikes out multiple time. I guarantee it. – Tim Lincecum will be asked by at least 15 fans if he is the teenage son of one of the other players. – St. Louis fans will chant “RAUUUUUUL!” even if they do not know why they are doing it. – The broadcasters for FOX will screw up simple facts at an approximate rate of 2.3 times per inning. Maybe he is Stubby Jr.? 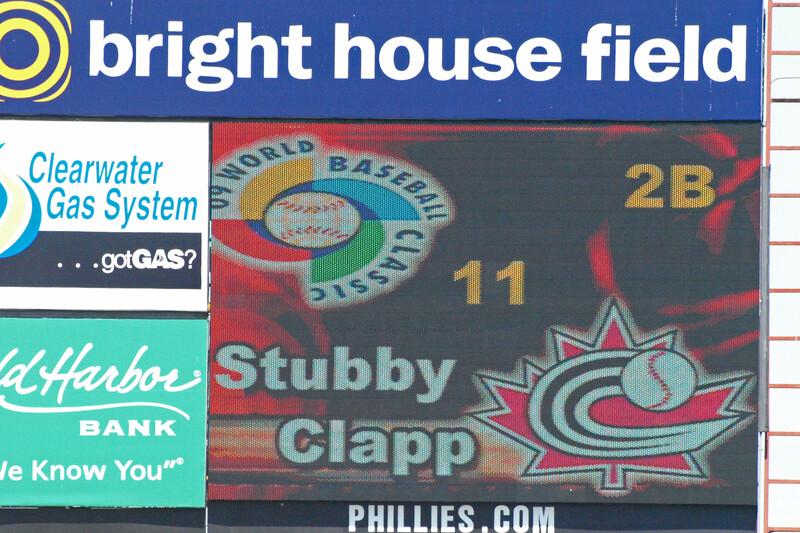 Well, Stairs and Morneau aside, it is no wonder Team Canada struggled against the Phillies. Anyway, before the game, John Mayberry Sr., former Kansas City Royal, and father of new Phillie, John Mayberry Jr., wandered over to say hello to Charlie Manuel and the gang. He was a proud papa today, watching his son move closer to making the 25-man roster. Mayberry Jr. smacked another home run and went 2 for 3 with 2 RBI on the homer. If Mayberry keeps this pace up, it will be difficult to send him to the minors come April. As for the competition for the back-up catchers position, Chris Coste has only made one start so far due to a hamstring injury, which is giving Ronny Paulino an opportunity to snag the job. Paulino has not been too impressive, which is good news for Coste, but he’ll need to get back on the field if he is going to keep the job. Coste did take batting practice today and looked solid, so it looks like he should be up and running soon. 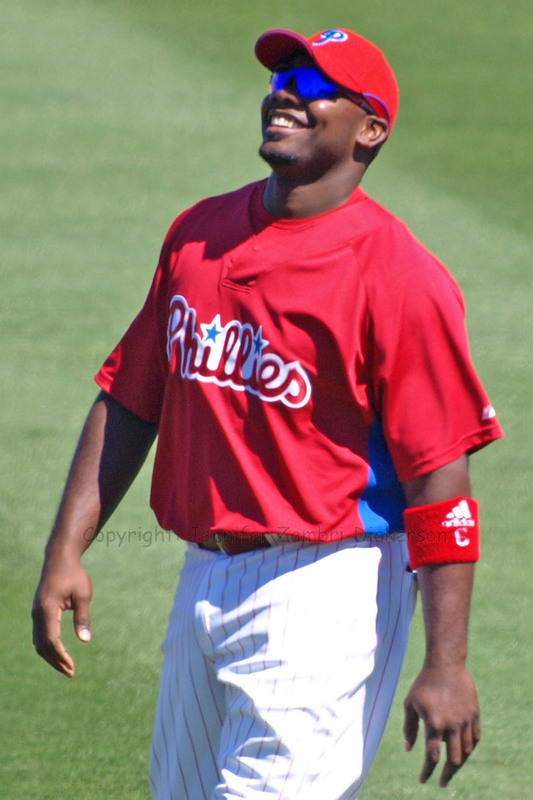 The Phillies will take on Jimmy Rollins, Shane Victorino and Team USA tomorrow at 12:05pm! *Remember also to check out our homepage My Team Rivals and our Phillies, Flyers, Eagles, Billy Penn Curse, Reinstate Pete Rose, Phillies Mets Rivalry, Phillies Marlins Rivalry, and Phillies Braves Rivalry and my very own Miami Dolphins page, The Dolphin Pod.